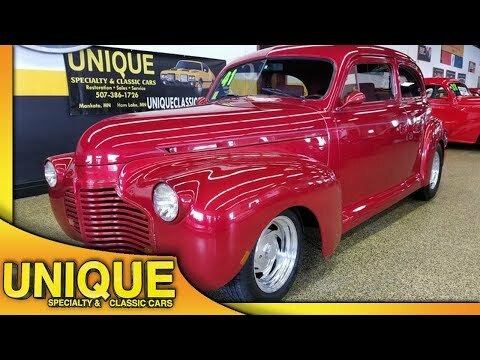 1941 Chevrolet Master Deluxe Streetrod with an all steel body. Riding on Boyds wheels with good rubber still. Under the hood is a 1991 RS Camaro 305 teamed with a 700R overdrive transmission. Headlights are frenched in. Power steering, power brakes, and vintage A/C. Door handles flush mounted into the door. Gas fill has been brought out into the rear right fender. Rear end is a 10 bolt chevy rear with a 323 Posi rear end. Frenched in tail lights as well. Custom roll pan, and license plate holder. Aluminum exhaust, walker radiator with electric fan and shrouds. Bucket seats up front with a center console. VDO gauges, tilt column, and updated radio. Door cards, headliner and seats are all in great shape. 2 speed wipers. Just a well put together street rod.